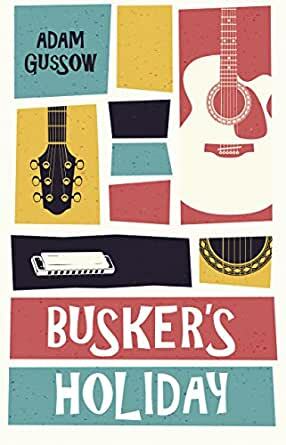 Busker’s Holiday is the story of McKay Chernoff, a Columbia University grad student with a harmonica in his pocket and a blues band in his background. Desolate and despairing after a disastrous romantic breakup, McKay decides to fly off to Paris and reinvent himself as a street performer. Adam Gussow is an associate professor of English and Southern Studies at the University of Mississippi and a professional blues harmonica player and teacher. He is the author of three books on the blues, including Mister Satan's Apprentice: A Blues Memoir, the story of his experience as a Harlem street musician. 5.0 out of 5 starsEUROPE OR BUST !! For anyone who was in their early 20's in the late 60's, early 70's will be able to relate to this even if they didn't make it to Europe. Since there was such a large part of that generation that was seeking freedom and many traveled all over the country and the majority of them would go from one music festival to the next one for the music and drugs were all they craved. Adam is a fantastic musician and a really down to earth type of guy who is very intelligent. However he uses all the above to really bring to life what it was like traveling through different countries where there was a very large amount of people from all over the world doing the same thing. That thing was to explore the different countries and meet the people while trying to earn some money by playing music with several different people he meets up with. It's really funny the way he explains some of the characters and places using what I would call, intelligent wit. You may not understand some of the words he uses to explain who or what he is talking about....but you can still find the humor behind it all. It's a great book and it was fun reading it even when I didn't really understand some of the language or vocabulary. Great job. You were young once, imbued with wanderlust and full of wild oats, or maybe still are, perhaps also broken hearted, or felt you were since your lover dismissed you, cruelly of course. So you're a veritable incarnation of Dionysus, in chains. Escape your torments. Plunge yourself into the maelstrom of the City of Light (enlightenment), the world's capital of Love and Sexuality, Paris, certainly. Speak a little French, and above all, be an incurably romantic musician. Work the streets blowing the blues by harmonica, snaring a multitude of willing groupies of the moment caught in your earthy rhythms and musical wolf calls. Throw caution to the wind and earn your living by adventure. If commitments and money keep you pinned to your spot, take the journey with Adam Gussow on his Busker's Holiday in Paris and the Europe beyond. He gives you an experience beyond your wildest anticipation, with a trajectory leading to the inevitable fall and resurrection, the obligatory maturation of a passionate soul. "What were blues but the songs you salvaged from the wreckage of your battered heart?" he writes. It's a vivid blend of life changing events and quirky characters born to entertain. Every sentence delivers the goods. And in the midst of an escapade of sensation and emotion, I caught myself in the sudden realization that I was also subliminally immersed in an exposition of blues history and suggestions of the seminal blues performers' contributions to the world's music. In what frames of fervid emotion were those passionate black blues classics created and evolved? Gussow has you experience them. He's a master of intense descriptive narrative evoking ambiance, mood, and emotion through a rapturous rendering of visual, sonic, visceral and redolent detail transporting you relentlessly through his groovy, and sometimes not so swell, experiences; and agreeably do you go along. Wow. This is a great read. Enjoy! Adam Gussow, a professor of English and Southern Studies at the University of Mississippi, is among the best younger scholars of blues culture one is likely to come across. He is no less, a superb, stylish, and gritty blues harmonica player who has, in his time, traveled and plied his trade as street musician and busker, most notably as part of the duo Satan and Adam, with guitarist/vocalist Sterling McGee. Gussow is the author of several fine books related to Southern and blues culture in America, and wrote a fine memoir of his relationship with McGee, “Mister Satan's Apprentice". This is mentioned just to establish that Gussow isn't a mere dilettante on the blues, mastering a few tricks and signature moves and then resting on laurels and a reputation made long ago; Gussow continues to gig, with McGee, as a solo performer, and in collaboration with a number of other musicians, often times in public, on the street, the hat out for loose change and scattered change, keeping himself honest with what he plays and maintaining a connection his vibe with the world of experience that is the energy the blues channels. He is a scholar who continues to seek the source, to find that invisible "it" behind the mere description and appearance of things as they present themselves. His first novel, "Busker's Holiday", is, I imagine, a fictionalized accounting of his own quest, a young man at particular moment of his life when what he's been doing in terms of study, romance and location no longer fits the skin he wears and gets an itch to try something else, to what happens. Set in the 80s, the novel regards the plight of McKay, a doctoral candidate in literature whose life has hit a rough patch. Reeling from problems in his relationship with his girl friend, McKay jumps at the chance to go on a five-week trip to Europe with his friend Paul. A blues fan, McKay gathers up his harmonicas and his amp, eager to perform before crowds on the Continent. McKay, the seeker of greater experience beyond the books and bourgeois heartache he has known so far, plunges into the center of things and allows himself to be swept along. There is something akin to novelist Henry James here, the 19th and early 20th Century American novelist who had as a major theme the confrontation of the New World (America) and the Old World (Europe). But where James' novels--"The American", "Wings of a Dove"--were long, measured, slow paced and geared to consider the interior lives, the changes of psyche, occurring over long stretches of time, Gussow instead goes for the Beat-influenced insistence on sensation, speed, the influx of sound, smell, and blurred vision. There is the velocity and mania of Jack Kerouac here, that point where the novel opens up with its landings in Paris and beyond, but author Gussow has a better command of the technique. He keeps the tone and pacing right; Kerouac and the Beats are an obvious and working influence on the style of this tale, but what we have here is something better and, I think, more honest to the experience. Kerouac is problematic for many of us, and for me, the issue was his willingness, his chronic need to make his already made pace even more intense with infusions of hip-argot, haphazardly placed modifiers. To paraphrase Gore Vidal, Kerouac used adjectives, verbs, similes, metaphors “the way truck drivers uses ketchup at a diner.” Gussow has a better command of the style, the instrument, which that he gets closer to the Charlie Parker concern of “making it all fit”, the Spontaneous Bop Prosody that Kerouac’s principle aim with his prolix excursions. The writing is vivid, alive, the mellifluous sentences flow when he goes at length and the shorter sentences have something of the Hemingway craft of resonating terseness. The prose has a remarkable sense of balance as the sensations accumulate, seemingly one atop the other, like airplanes stacked over Holiday period airports, but rather than stumble or lose the beat, the details, the patter, the interior monologue reflecting upon and then joining in the conversation McMay is having with the world and the people he takes the journey with is deft, smooth. For all the temptation to write run-on sentences, without pause, until an idea actually hits him, Gussow has a remarkable craft here, giving the reader a broad, nearly all-encompassing view that at times threatens to become an impressionistic blur. He knows his tempos well and how effective they can be if used with the right measures of grace and restraint. There is a poetic crystallization that is not sacrificed in the name of dredging tangents and facile sightseeing. It is a recollection that resonates. McKay is delivered very well; an engaging, seeking, impatient, naive, curious man in search for knowledge and new means to express a growing feeling of a rich inner life. The writing is swift but disciplined, loose but always aware of where the rhythm truly is, is a match for the harmonica playing and instrumentation you’ve described. It is a wonderful and engaging accounting of being within the experience of performance, or when the chops fail and where they come together.